Background The SRI(4) is a composite endpoint used in SLE clinical trials. A post-hoc analysis of two Phase III studies of belimumab1 showed that the achievement of an SRI(4) response at 52 weeks is associated with clinically meaningful benefits, irrespective of the treatment assignments. Confirmation of these findings in independent cohorts will enhance the wider acceptance of SRI(4) as a measure of clinically meaningful improvement. Objectives We assessed the global clinical benefit represented by the achievement of an SRI(4) response in patients with moderate to severe SLE. Methods Changes from baseline in clinical, laboratory, and patient reported outcome measures at Day 365 were compared between SRI(4) responders (n=396) and non-responders (n=340) in the combined dataset of two Phase II studies that evaluated sifalimumab and anifrolumab in moderate to severe SLE. Results (detailed in Table): Baseline demographics were similar between the two studies. At Day 365, a greater percentage of responders than non-responders had a ≥7-point reduction in SLE Disease Activity Index 2000 (SLEDAI-2K) and achieved a reduction of oral corticosteroid dose to ≤7.5 mg/day. Responders also had a greater percentage change from baseline in clinical SLEDAI scores, greater improvements in the Physician's Global Assessment (PGA) score and the number of organ domains with improvement on SLEDAI-2K. The rates of British Isles Lupus Assessment Group (BILAG) “A” or “2B” flares were lower in SRI(4) responders compared with non-responders. Among patients with ≥8 swollen and ≥8 tender joints at baseline, a larger percentage of responders had a ≥50% improvement in swollen and tender joint counts. 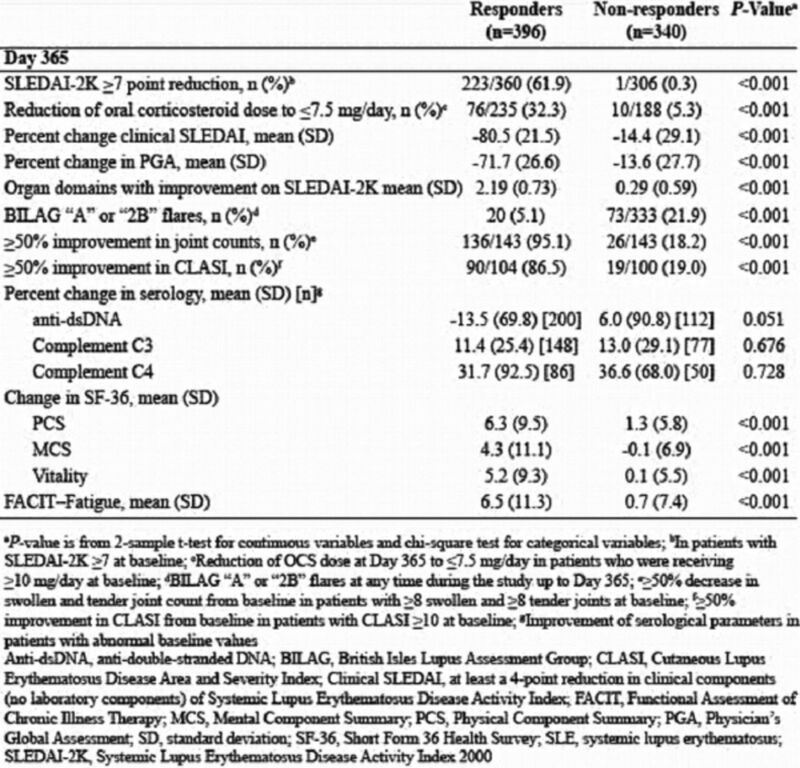 In patients with moderate to severe skin disease at baseline, defined as a Cutaneous Lupus Erythematosus Disease Area and Severity Index (CLASI) activity score ≥10, a greater percentage of responders had ≥50% improvement in CLASI. In patients with abnormal baseline serological parameters, responders had greater improvements in anti-double stranded DNA concentrations; however, the differences in complement C3 and C4 concentrations were not significant. Responders also had greater improvements in patient-reported outcomes: percentage change from baseline in Patient Global Assessment, and absolute change in Short Form 36 Health Survey (SF-36) [Physical Component Summary (PCS) score; Mental Component Summary (MCS) score; Vitality domain], and Functional Assessment of Chronic Illness Therapy (FACIT)–Fatigue scores. Conclusions SRI(4) response in patients with moderate to severe SLE was associated with broad improvements in clinical, laboratory, and patient reported outcome measures. These results confirm previous findings, indicating that SRI(4) response is associated with a global clinically important benefit.